Photos by Kira Hoffman (left) and Brian Starzomski. 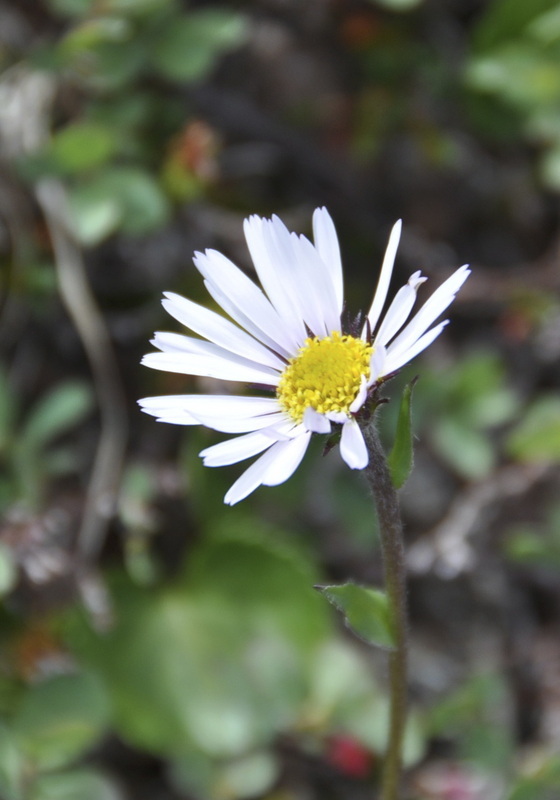 Subalpine daisy is one of the most common daisy species in BC. It has unbranched, solitary stems that grow to 70 cm tall. Flowers consist of pink, lavender, or reddish-purple ray flowers with yellow disc flowers. The bracts around the flower heads are sticky-hairy or hairy, and the flower heads occur singly or in small groups. The basal leaves vary in size and shape, but are generally lance to spoon-shaped; the stem leaves are similar but may be reduced in size and clasping the stem. See the E-Flora species page for further identification information. 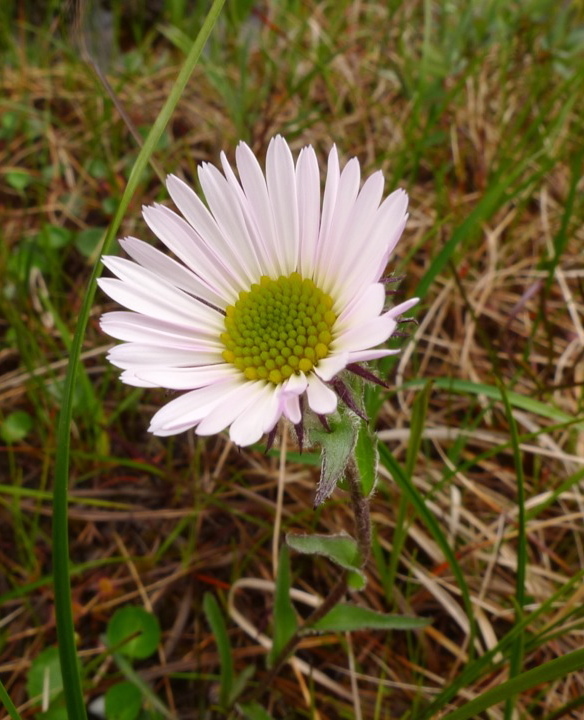 Subalpine daisy grows in moist to wet habitats, including meadows, streamsides, bogs, rocky slopes, and open forests. It is found from low to high elevations throughout much of western North America, and is a common species in BC. There are two subspecies in BC - one found west of the Coast-Cascade (ssp. peregrinus) and one found east (ssp. callianthemus). 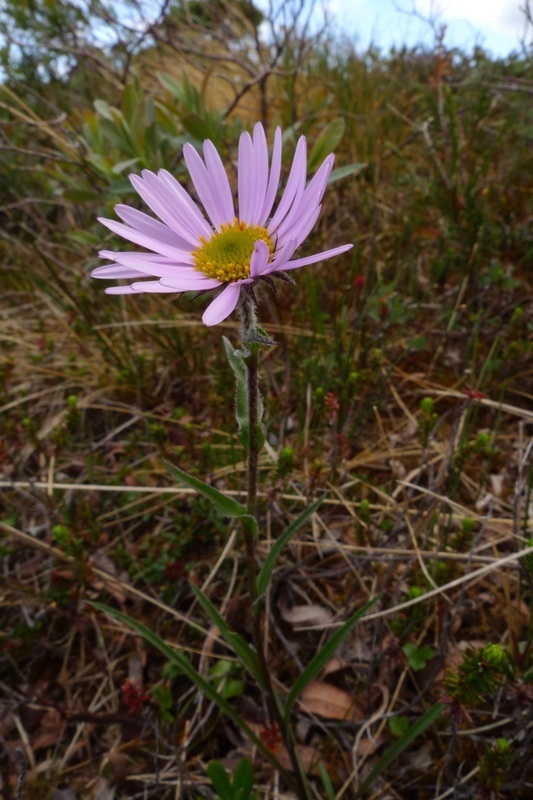 Leafy aster (Symphyotrichum foliaceum) is a similar daisy species with branched stems. As well, the bracts around the flowers are graduated in size, whereas those of subalpine aster are equal in size. Subalpine daisy is a decent forage food for livestock and native species. Erigeron peregrinus (Banks ex Pursh) Greene. In Klinkenberg, Brian. (Ed.). E-Flora BC: Electronic Atlas of the Plants of British Columbia. Lab for Advanced Spatial Analysis, Department of Geography, University of British Columbia, Vancouver. Accessed 02/05/2014. Pojar, J. and MacKinnon, A. (1994). Plants of Coastal British Columbia. Vancouver, BC: Lone Pine Publishing. P. 284.